13 Why do you contend against him, saying, ‘He will answer none of man’s words’? Yes, Susanne, it is very good news though His allowing suffering in our lives to get our attention and to bring us to where we need to be to have an open fellowship with Him… that is not so fun. I relate to what Elihu said, “Man is also rebuked with pain on his bed and with continual strife in his bones…” Sometimes my bed can be a torture rack with so much joint pain that I live with. I am very sorry to hear about your ongoing pains, my brother. 🙁 Alas, this quote by C.S. Lewis rings true. Sigh. BTW, I love that picture of the broken heart shaped mirror. Our broken hearts can be used of God to show us much about ourselves as well as His mercy and love for us. My first comment on your blog got lost so here it goes again. Elihu was the only one of Job’s friends that God did not rebuke. He was right in what he said all the way through this book. God DOES do all He can to bring us to a saving knowledge of Himself. He speaks through dreams, nature, coincidences, and even our pain and suffering. The most important way is through the gospel of His Son for through it all these other ways are made evident by the very life He live and the death by which He died. His allowing suffering in our lives to get our attention and to bring us to where we need to be to have an open fellowship with Him (“the fellowship of His sufferings”)… that is not so fun. I relate to what Elihu said, “Man is also rebuked with pain on his bed and with continual strife in his bones…” Sometimes my bed can be a torture rack with so much joint pain that I live with. Yes, Elihu was the only friend of Job who displayed God’s wisdom. It seems he knew God while these other friends were acquainted with worldly/religious wisdom only. Susanne, even these two things seem to be an illustration of things spiritual and things carnal. In fact, what is precious in God’s sight is considered folly in this world while what is important in this world is absolutely worthless in God’s eyes. And WordPress is (clearly) a worldly website provider. Exactly! And those who speak with God’s heart are outnumbered by those who try to but can’t. Sue….. I love the flower That is good news! Thank you, Ken. It is interesting you said this because as I took the picture last week in the City Park in Fürth right beside the church building there, I had to focus in on the crocus since it was so very small. But I thought that this and other flowers like snowdrops were the first signs of forthcoming spring time in about two months or so. Small frail beautiful flowers made by God for you to enjoy which could have easily been overlooked by those whose vision is filled up with that gigantic man-made church. Funny how God proves our hearts even in such things as this every day. Scripture fits! Sometimes it appears to me that we need to look down, too, as we keep our eyes on Him. 🙂 Yes, We can get so focused on “Jesus out there” that we end up stepping on His frail “little ones” down here. One time I was walking in the woods feeling all alone for I had not heard from Him in many months and a tiny little flower of this same color as yours, caught my eye. I had to get on my knees (another parable) to see what it was. It had four petals and was only 7mm square! Jesus told me that He put it there just for me, knowing I would be feeling forsaken and walking in that remote spot that day. What a great God we have! The color purple relates to the imagination and spirituality and allows us to get in touch with our deepest thoughts. The difference between violet and purple is that violet is displayed in the visible light spectrum, while purple is simply a mixture of red and blue. Violet vibrations are the highest in the visible spectrum. Although violet is not quite as intense as purple, their essence is the same. Generally speaking, the names are interchangeable and the meaning of the colors are the same. Both colors contain energy and strength from the color red, with spirituality and integrity from the color blue. The colors symbolize the union of body and soul, which creates a balance between our physical and spiritual energies. The color purple or violet assists those seeking the meaning of life and spiritual fulfillment. They expand our horizon and connects us to a higher level of consciousness. For the same reason, philosophers around the world are often attracted to these colors. In color psychology, purple and violet represents the future, imagination and dreams. They inspire and improve our psychic abilities and spiritual awareness as well as ensure that we stay grounded and down to earth. The color purple relates to the world of imagination and the need to escape the practical and everyday life. It’s the daydreamers escape from reality. From a color psychology perspective, purple and violet ensures harmony of the mind and the emotions and contributes to mental balance and stability, peace of mind, a connection between the spiritual and physical world, and between thought and action. Violet and purple promotes meditation. The color violet inspires unconditional and selfless love and promotes sensitivity and compassion. Violet may be sensitive to all the different types of pollution in the world today, whether it is air pollution, noise pollution, visual pollution or contamination of our food chain. This sensitivity makes violet susceptible to diseases and allergies, and vulnerable to its own familiar surroundings. The color purple calls for creative doings and seeks inspiration and originality through its creative efforts. It likes to be unique, individual and independent – not one of the crowd. Artists, musicians, writers, poets and healers are all inspired by violet and its magic and mystery. Violet is the color of humanitarians who likes to do something good for others. The combination of wisdom and power combined with sensitivity and humility, makes violet capable of helping those in need. The purple color meaning equals power. It has a richness and quality that demands respect. Purple is ambitious and confident – it is the leader type. Too much of the color purple can promote or exacerbate depression for some people. It is a color that should be used very carefully and in small quantities by those who are vulnerable to it. Woweeee! Is right! All that you made in bold really spoke to me about my life and search and what I know about your God given nature and spiritual search as well. Yes, everyone can hear God if they will but listen, and it is very good news! I, also, love the mirror photo: it speaks to me of how each person hears and sees God a little differently from everyone else. The whole picture is there, but we reflect it according to our brokenness and life situation. 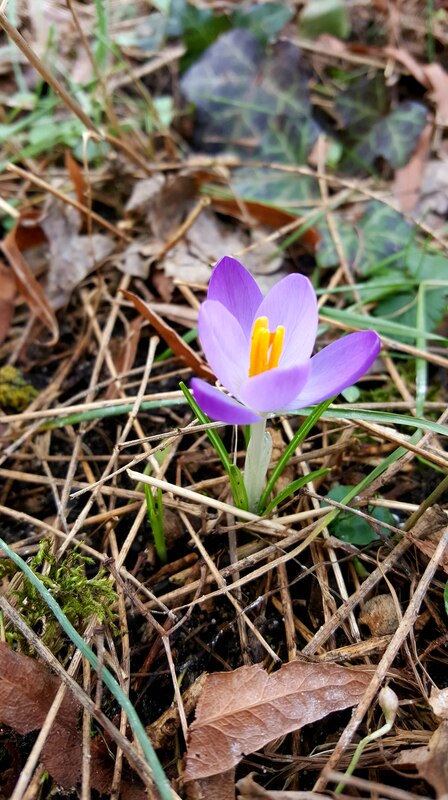 Btw, I took that picture on the very same day last week as I took the picture of the crocus. 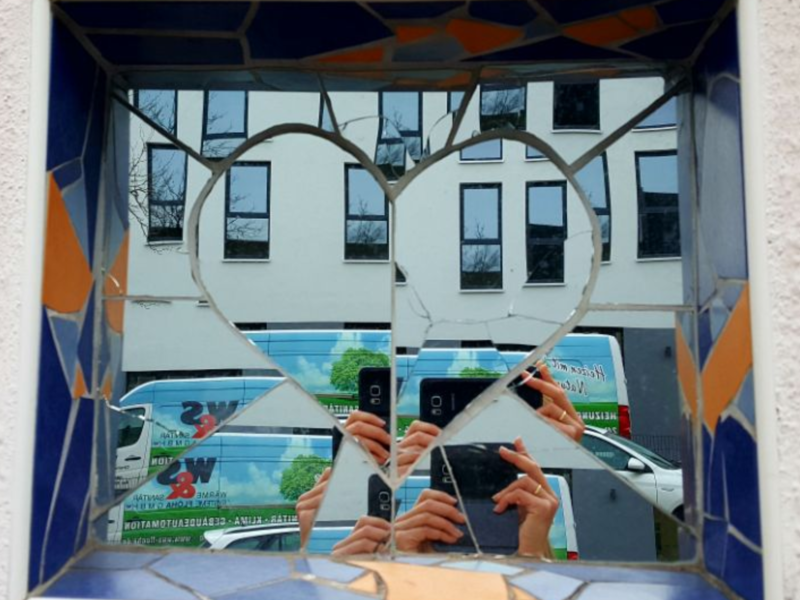 I found the heart-shaped mirror outside in a (visual cover, kind of protecting) wall of another Protestant church where you could also see a broken mirror dove, the ichtys (i.e. fish) symbol for Jesus Christ, the all-seeing eye of God etc. All symbols were created out of broken fragments of mirror glass. During the years I considered myself an atheist, I thought the Book of Job the ultimate illustration of religious folly. Of course, I was the foolish one. I love Book of Job now. It is one of the most profound accounts of suffering ever penned. Yes, Anna, like you, I had similar thoughts about this book. Especially, the idea that God seemed to somehow negotiate part of Job’s fate with Satan, that was hard for me to swallow. But who could ever understand God’s ways with us little human beings? 🙄 Well, that is one thing Job had to learn to accept the hard way back then, too.